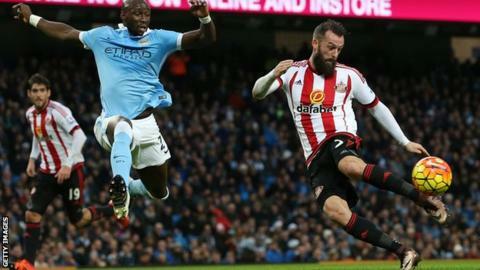 Sunderland have released strikers Steven Fletcher and Danny Graham, defender Wes Brown and goalkeeper Steve Harper. Scotland forward Fletcher, 29, signed from Wolves for £12m in 2012, ended last season on loan at French side Marseille. Fellow striker Graham, 30, was on loan at Blackburn Rovers. Ex-England defender Brown, 36, ends a five-year stay on Wearside, while Harper, 41, leaves after 12 months. Fletcher scored 23 goals in 108 games for Sunderland following earlier spells with Burnley and Hibernian. Graham scored only once in 42 appearances for Sunderland after signing from Swansea City for £5m but is wanted on a permanent basis by Blackburn after scoring seven times in 18 Championship games for Rovers last season. Centre-back Brown, 36, started 83 games after joining from Manchester United but former Newcastle and Hull City keeper Harper did not make a single appearance after arriving as cover.